Every other Tuesday we have a sales meeting for all New York City Compass agents, and this week it was held at Compass New Development project, Soori High Line! 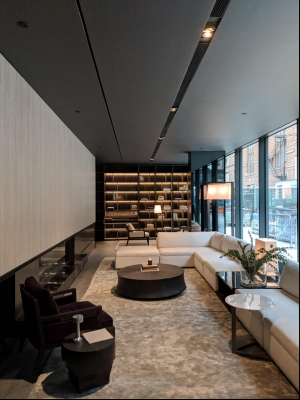 Not only was it nice to break away from the traditional meeting spot on the 8th floor of Compass HQ, but it was even better having the opportunity to privately tour one of the city’s most buzzworthy new condo projects. From the moment I walked in and saw the chic lobby lounge, I knew I was going to like this building. The meeting took place in Unit 5A, however before it started, I took a quick tour of the model unit (5B). My favorite part of this residence was the private outdoor heated salt water swimming pool, which can be accessed from a small deck off the kitchen or the ensuite master bathroom (pictured below). With seamless transitions between indoor and outdoor living, the residences provide resort-like living and certainly have me dreaming about my next vacation -- especially after all these nor’easter snow storms! Soori High Line was designed by award-winning international architect Soo K. Chan and marks his first project in New York. The Empire State Building now has a flashy nightly light show -- according to Time Out, the Empire State Building will now be putting on a sparkling light show on the hour, every hour, between sunset and 2am. The sassy skyscraper sparkle parties will last for five minutes and showcase the building’s advanced LED light system, that was completely overhauled in 2012. You can share your photos and videos of the new flashy light show on social media using the hashtag #ESBsparkle. Hey there, it’s nice to meet you. I can’t tell you how excited I am to have joined Compass, but more importantly, the Scholz Team! You’re probably wondering who I am, where I came from, and why I decided to join Compass and this team. I currently live in Williamsburg, Brooklyn with my boyfriend and the occasional foster dog. I grew up in Pittsburgh as the oldest of four boys, spent four amazing years at Lehigh University studying finance and real estate before making my way to New York City. My first apartment was actually across the Hudson in Jersey City for a short year, and since then I’ve been in the city: first in Sutton Place/Midtown East, then Chelsea, and now Williamsburg. Prior to joining Compass I worked at PNC, most recently in real estate banking where I got to learn the New York City market while working on construction loans and commercial mortgages. After 5 ½ years, I was ready to say goodbye to spreadsheets and hello to the people and properties that give New York City its pulse. When the time came to pick a brokerage firm, I knew Compass was where I wanted to be after friends who worked here raved about the culture. I had to experience it for myself. And when an agent friend introduced me to Cindy, he said, “I could really see the two of you vibing.” The rest is history! Tax season means that everyone is looking at their financials- from corporate entities to mom and pop shops to individual employees, it's the time of year to take a step back and asses. One important step in that process should also be to check your credit score and make sure that nothing looks out of the ordinary. Privacy breaches in 2017 at some of the top credit firms mean that it is vital to explore options to protect access to your credit. One of the most effective ways to do this is freezing your credit. Click here to freeze your credit and click here to read about other ways to protect yourself and your finances. One frequently overlooked design element in kitchens, and especially in New York kitchens, is color. Like many of you, we appreciate the clean and fresh feel of a muted or white kitchen; but adding color can go a long way to add style and personality to your home. From easy touches of color with art or planters to going full in with a tiled backsplash or school bus yellow oven, why not cook up some color in your kitchen? One of the more expensive touches of color would have to be the appliances. Adding color this way may seem dangerous, but just look at the pay off. Cabinents, accent chairs, tiles, and art are also great ways to incorporate color. For more ideas on adding color to your home, click here. According to the New York Times, the beloved Yorkie, aka the Yorkshire Terrier, is the number 1 dog in New York City as of 2016. Here at The Scholz Team, we certainly understand why. Yorkies are highly intelligent, independent, and courageous -- all good traits to have to make it in the city. Of course, size helps the Yorkie too- they're great for small apartments and easy to carry in a bag or otherwise. The Shih Tzu was second followed by the Labrador, the top large breed dog, and fourth the Chihuahua. To read more about the New York City dog census, click here. Cindy Scholz was recently featured in a Real Estate Weekly article featuring her prominent role in chashama- a New York-based charity that works to secure space for artists to create and display their art in the city. Anita Durst heads the organization and supplies the knowledge and institutional support of her family's longtime business. To read more about chashama click here for the full article or visit their website here. Ceilings are always above us, but not always considered. Here are 3 great ways to upgrade the aesthetics of your space and increase the value of your home. If you are considering remodeling a space, be open to the idea of putting money towards the ceiling for a simple way to make a big impact. Just whatever you do, don't do popcorn cielings! Every home has a few eyesores that may spoil the whole look or design of a space. We'd like to share some easy ways to cover them up and keep your home feeling complete. From clever ways to hide your router to integrated design elements to hide air conditioning- let these ideas inspire you to finish a project at home. For the complete list click here. Can you spot the AC unit on this wall? Neither can we. Women Investing in Sustainable Empowerment is The Scholz Team initiative to inspire women to seek and secure the keys to their own financial independence. Through WISE, our clients can work with a talented team of female attorneys, financial advisors, mortgage brokers, designers, and real estate professionals to find, purchase, sell, or rent their home or investment. Through WISE, we hope to encourage women to seek the keys to their own future through making sound investment and financial decisions. And for every client that elects to use our WISE program we will donate a portion of our proceeds from their deals to Women In Need- A New York based charity that seeks to improve the lives of women and children in the city. Brooklyn echoed Manhattan market in closing activity this quarter as buyers anticipated sweeping changes of the tax legislation and rushed to lock in the full $1M mortgage interest deduction on new originations. This urgency was reflected by a 14% year-over-year increase in the number of closings by December 15th, coupled with a surge of transactions occurred in the $500K-$1M price segment, which was most impacted by the mortgage interest deduction limit change. Additionally, it is interesting to note that the resale condos and co-ops primarily contributed to the year-over-year increase in the number of closings. While the new development closings distributed with less extremity this quarter against 4Q16, demonstrated by five vs. two projects with 10 or more closings totaling the same number of 106 transactions. The maximum mortgage amount to qualify is lowered from $1 million to $750,000. Still available on a first or second home, but combined cannot exceed $750,000. No longer allowed for home equity loans (it was previously capped at $100,000). Because this deduction remains a still significant amount at $750k, this change will have minimal impact on homes under $1M. There will be some downward pressure on home prices above $1m, however, this will be offset by what are likely to be record corporate profits and a record stock market (thanks to other parts of the new Tax Code), both of which have a direct positive correlation to the real estate market. Maximum of $10,000 deduction for state and local income, property, and sales taxes combined for individuals. The impact of SALT and mortgage deductions only impacts those who itemize, and there will be fewer people itemizing due to the doubling of the standard deduction and Alternative Minimum Tax (AMT). Mortgage and SALT deductions have no impact on foreign buyers. As global economies continue to thrive, foreign buyers will continue to invest in NYC. Like-Kind Exchanges remain for real property not held primarily for sale. No changes were made to the capital gains primary residence exclusion, nor to capital gains rates. The protection of the 1031 Like-Kind Exchanges and the protection of the Capital Gains Exclusions on the Sale of Property, will also be stabilizing market influences in the months to come. In short... there will be changes, but change is a constant in life and should be seen as opportunity. Feel free to reach out to me to discuss further, and I can happily recommend some great financial professionals to help you explore your options for this coming year... talk to you soon! Can you imagine a kitchen where your countertops actually help prevent the spread of germs? According to https://www.decoraid.com/, 2018 is going to be the year of the antimicrobial countertop! Porcelanosa Grupo has created a countertop that kills bacteria on contact and even helps purify the air. Keep an eye out for this technology to make its debut in a showroom or home near you. Click here for the full article. Looking for a laugh? This January 5th, 50 comics will each present a brand new first joke of the year at 50 First Jokes at the Bell House in Brooklyn. Click here for more information! The Q4 2017 Manhattan Market Report from Compass is out today. Among other topics, the report addresses growing concerns of the implications of the 2017 Tax Bill. In anticipation of sweeping changes to tax legislation, resale activity ramped up during the fourth quarter as buyers rushed to lock-in the full $1M mortgage interest deduction on new mortgage originations. Resale closings for condos and co-ops within the $1M - $3M price segment, where buyers could be most impacted by the new limit in mortgage interest deductions, increased 11% and 13% year-over-year, respectively. Furthermore, resale activity within the $500K - $1M price segment increased 21% year-over-year as potential buyers originally feared a mortgage interest cap of $500K. In fact, median condo resale prices were down 13% this quarter compared to 4Q16, which was not attributable to any particular project or neighborhood, but as a result of a broader shift in resale volume to units priced between $500K - $1M. However, it remains to be seen how the GOP Tax Bill will impact Manhattan real estate performance long-term, especially when taking into account the $10K cap to state and local income taxes (SALT) deductions, lower marginal taxes for many income brackets, and the new $750K limit in mortgage interest deductions. The Scholz Team helped more than 115 families find their place in the world in 2017. We worked with buyers and sellers throughout the city, from Jackson Heights to Sunnyside, from Ditmas Park to Bed Stuy and Brooklyn Heights, and from TriBeCa to Hamilton Heights- we know buying and selling in New York and how to work anywhere our clients take us. We were also happy to help clients find the right agent and home in California, Chicago, New Jersey, and South Carolina. Our national network of real estate professionals allows us to help all of our clients make intelligent investment decisions, no matter what market they are in. The MTA has announced plans to add cars to make C Line trains longer during rush hour, fitting 25% more riders per train. The MTA has begun running a few longer train cars on the C line in order to accommodate neighborhood growth around it, according to agency spokesman Jon Weinstein. The longer cars, known as the R46 model, were built in the 1970s and currently run on other lines including the A. These cars are 75 feet long — 15 feet longer than the current models that run on the C.
That added space increases capacity on the line by 25 percent per train set. In total, five sets of eight-car R46s are running on the line, mixed in with two other models. “Lengthening C trains was a promise made — and kept — under the Subway Action Plan to increase capacity and improve service for our riders,” Weinstein said in a statement. The Scholz Team's most trusted Financial Advisor, Mariam Adams of Merrill Lynch, reports that the Bank of America Merrill Lynch Global Research arm is expecting a steady rise in global markets as recovery continues in 2018. She reports that "The slowdown in China has leveled off, and a number of economies that slipped into recession in 2016 are now in recovery." Top sectors for 2018 are Technology, Materials, and Financial Services. If you would like to read the full report, message us today or contact Mariam directly at mariam.adams@ml.com or via phone at (212) 236-9103. Running low on cash this Holiday Season? Wish that you had a little more green to stuff everyone's stockings? Maybe the Rent Stole your Christmas! Every year, thousands of New Yorkers across this city fall victim to the Christmas Rent Grinch- Holiday parties, gifts, dinners, and cheer come with a price tag and so does renting. Spending your hard earned cash on someone else's equity just isn't wise. Owning a home allows for your money to appreciate and gain value over time as well as help reduce your tax burden. And, owning in New York can often be the same price per month as renting. Don't believe us? Take for example the new, luxury Brooklyn development, 550 Vanderbilt. A studio purchased there with 30% down will yield a $2,488 monthly payment with the mortgage and common charges. The rent for a similar unit in the same exact building is $2,500. And while the costs are the same, the person paying to own is building equity, investing in their future net worth, and reducing their tax burden. So plan now and next year give yourself the gift of home ownership and take back Christmas! The New York Times has examined a new New York City website listing construction permits between 2000 and 2016 and found some interesting data. While conventional permits were largely focused on Manhattan, A1 and NB permits (Permits that allow for changes in use, occupancy, or egress) were largely centered in Queens and Brooklyn- highlighting the fast-paced changed those boroughs have seen in New Development in the last twenty years.